We’ve all heard the saying, “something old, something new, something borrowed, something blue” when it comes to discussing bridal accessories, be they your shoes, your veil, small trinkets, or something else entirely. It can be tricky to think of items that you can wear for each part of the saying, so we’re here to help you! If you do choose to wear a friend or relative’s wedding dress on your big day, then this heirloom could probably use some alterations. Here at Blue Bridal Boutique in Denver, our in-house seamstress would be happy to help you create an heirloom you can wear down the aisle. Read on for more ideas, or visit our bridal store today! Bridal veils are timeless pieces. 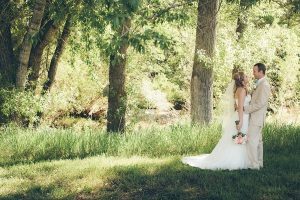 They do not drastically change throughout the years, so whether you want to borrow your sister’s veil or use your mom’s veil as something old, a bridal veil is a great heirloom to utilize for your wedding day. Bridal headpieces can be passed down from your mother, sisters, aunts, or grandmothers. A vintage hairpiece is a showstopping heirloom for your wedding day — and one that you’ll appreciate in photos for years to come. A family heirloom such as a wedding ring that is passed from generation to generation is a sentimental and special gift to be able to receive and wear on your wedding day, and every day after. 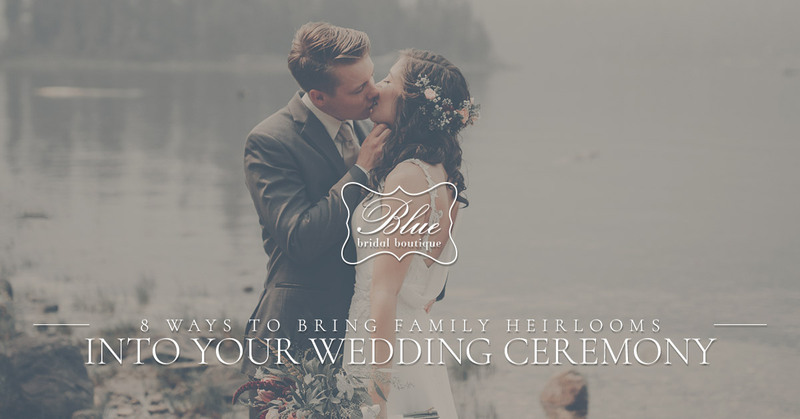 A blue silk handkerchief from your father would be a great heirloom to either wrap around your bouquet or to sew a small patch of onto the inside of your gown. Don’t underestimate the power of a vintage wedding dress! Wearing your mother’s wedding dress or cutting a piece out of her dress to use on yours is a beautiful statement for your mother to feel recognized and for you to feel connected to your family. Dress alterations could be necessary to make the wedding dress fit and look just right. A lovely little hand-me-down to use on your wedding day is a ring bearer cushion that has been used in a wedding ceremony before. Intimate, sentimental, and subtle, the traditional bridal garter is a perfect present for a special woman in the family. Repeating vows that your parents said in their wedding is a beautiful verbal heirloom that would be beyond touching when said at your wedding ceremony. It is a beautiful thing to be able to protect or pass down items to a bride or groom. Whether it is a tangible or intangible item, a family heirloom is a special, heartwarming way to make your day more special both now and even years down the road. One of the most popular ways to honor your family on your wedding day is by wearing your mother’s or grandmother’s vintage wedding dress. If the style isn’t quite right or the sizing isn’t exactly perfect, you can count on Blue Bridal Boutique for wedding dress alterations. 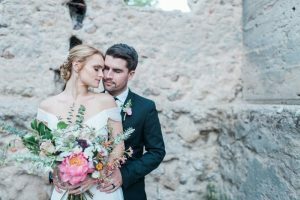 Our in-house seamstress is an expert, and she would love to provide wedding dress alterations that will turn a family member’s wedding dress into your own. Learn what you need to know about wedding dress alterations, and then schedule an appointment with our seamstress. We don’t currently offer online booking for dress alterations, so give us a call to set up your appointment today!